Robin Hood, released in 1973 by Walt Disney Studios, is another well beloved animated classic, at least to the audience that has grown up with it. It was fairly well-received by critics at the time, but doesn’t garner as much of their favor today. I happen to really like Robin Hood, so you won’t find me saying anything negative about it. After all, it’s only a children’s movie. Now that may come as a surprise to those who haven’t seen Robin Hood. You would think that with a story like it, you could carve out a really good adventure story for people of all ages. And truly you can. The Adventures of Robin Hood, Warner Bros.’ version starring Errol Flynn from 1938, is THE best example of this. It’s not light enough to be considered silly children’s entertainment, but yet it’s still dark enough that adults can find some grounding with it, and also be present while their kids are watching it and not be bored. So it’s a film for everyone. Disney’s Robin Hood doesn’t follow that pattern at all. It’s much sillier, but I believe it’s by design. As for Robin Hood’s story, there isn’t much of a story, at least not in this incarnation of it. This version of Robin Hood seems to be under the impression that you’re already familiar with the legend already, and that important events and/or characters can be jettisoned out of the proceedings. It’s not that it’s an obtuse version of the story, it’s just that it’s leaving out details that aren’t vital for children to understand it, which is how it plays out to me. The moment that King Richard returns from the crusades and finds what’s happened to his kingdom while he’s been gone? That’s not here. Robin’s gang of merry men? They’re not here either. Everything is stripped down to the essentials and it’s all down to the basics, and in a children’s movie, you can’t make things too complicated, elongated or confusing or you might lose your audience. 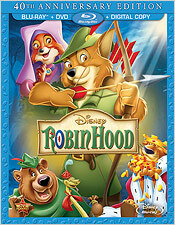 This version of Robin Hood is full of whimsy and fun, with only the mildest of drama to keep things interesting. All of the characters are charming or funny in one way or another, even the villains. But enough dissection. Is the movie any good? Well, of course it is. What a silly question. Robin Hood is absolutely adorable and impossible to find at least a little charming. I’m sure there are some snobbish movie-watching types who will find it boring, but you have to be a child, or at least a child at heart, to enjoy it. I think it also helps if you saw it when you were young, like a lot of us did. Nostalgia can be a powerful thing when it comes to movies, especially ones like this. It’s not trying to do anything more than entertain you in a very simple way. It never gets weighty with too much exposition or even bogged down in drama between characters, and neither does it stop for songs very often. And even when it does, the songs are enjoyable. When it comes right down to it, it’s a classic version of a classic tale told in its own way. As for Disney’s treatment of Robin Hood on Blu-ray. you’ll find a new digital restoration has been undertaken. Picture quality is pretty spectacular, that is, once you get past the opening credits. It’s the only time when the quality of the film is overtly questionable. It has a glossy, soft look to it, which I’m guessing is from an attempt to thoroughly clean up the credits, which are usually some of the filthiest areas of a film print because of the title overlays. However, after that sequence is over, there’s a vast improvement in picture quality. As always, grain has been erased from the images extensively, but not enough to erase fine detail. The animation cels are still dirty with all of the original pencil markings preserved, which is fantastic. So although grain has been removed significantly, image detail is still very good. The film’s color palette looks better than it has in previous DVD releases, with colors looking much fuller and bolder than before. Blacks also are better, and quite deep, while the contrast is at an appropriate level to show off all of the detail quite well. For the audio portion, you have a few options: English 5.1 DTS-HD, English 2.0 Dolby Digital, French 5.1 DTS-HD High Resolution and both Spanish & Portuguese 5.1 Dolby Digital. The new DTS track offers up a lossless presentation of a very front-heavy soundtrack. All of the dialogue is very clear and understandable, while the music and sound effects show their age a bit, but still come through crystal clear. You won’t find a whole lot of activity in the rear speakers, so surround activity is a bust, but you do get some low frequency push, surprisingly. I would have preferred a lossless version of the film’s original mono soundtrack as it was, but this soundtrack will do. It doesn’t do much for multiple speaker output, but it doesn’t do anything to offend it either. There are also several subtitle options for those who need them as well, including English, English SDH, French, Spanish and Portuguese. For this Blu-ray’s extras selection, you have a minor amount of material to dig through. Newly-included (at least to my knowledge) is a deleted storyline entitled Love Letters; an alternate ending; a Disney Song Selection option with four songs (“Oo-De-Lally”, “Love”, “The Phony King of England” and “Not in Nottingham”); a Robin Hood Art Gallery (animated); Robin Hood Storybook (also animated); a Sing Along With the Movie subtitle option, a “Oo-De-Lally” Disney Sing-Along song, the bonus short Ye Olden Days; a set of sneak peeks, which also open the disc; a DVD version of the film, which includes some of these extras plus a set of games entitled Robin Hood’s Merry Games; and finally, a paper insert with a Digital Copy code. All of the previous extras from both the Gold Collection and Most Wanted Edition DVD releases have been carried over, except for a couple of trivia and interactive games. Overall, it’s a bit disappointing to me, personally. I wanted to know more about the actual making of the film, but it’s still nice to see a set of extras that includes nearly everything from previous releases. Disney has a bad track record for that. Robin Hood may not be the best of Disney’s animated library, but it’s certainly one of their most whimsical and enjoyable. I find that returning to films like this when I get older takes me right back to my childhood, and I’m sure it will do the same for those who also grew up watching it. For those that didn’t, get ready to experience a classic. Very much recommended.